PHILADELPHIA—(December 5, 2018)—The Community Design Collaborative, in partnership with Partners for Sacred Places, hosts the Public Reveal and Final Jury Review for its Sacred Places/Civic Spaces design challenge. The goal of the initiative is to determine how historic sacred places can support civic engagement, social cohesion, and neighborhood equity. 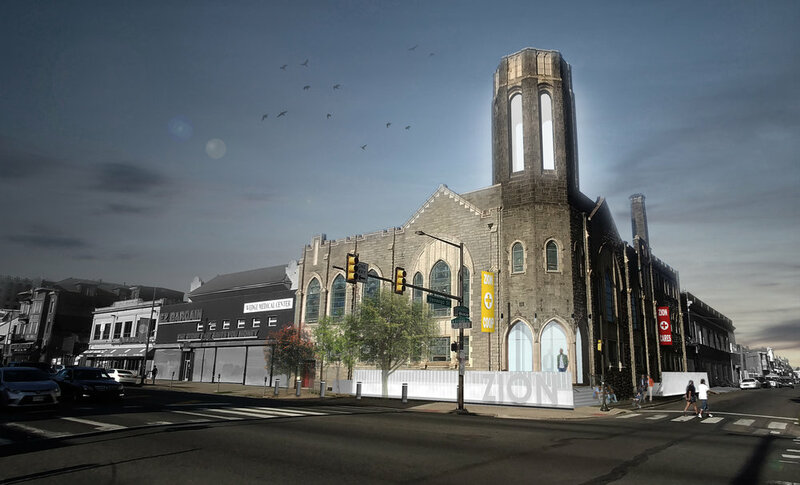 Three religious sites, three community organizations, and three design teams are collaborating to re-envision historic purpose-built religious properties as community hubs. The teams, each matched up with one of three sacred spaces selected through a competitive process, have been working on transformative design concepts for the sites since the summer. A crucial element of the design process has been community engagement, with each team engaging the congregation, community partners, and neighbors in asset mapping, concept development, and developing initial designs. Studies show that sacred places are often the most trusted institution by parents, children, and seniors—those that naturally benefit from the invisible safety net these spaces provide. 87% of the beneficiaries of community programs and events that take place at sacred places are not members of the associated religious congregation, and the programs and services, ranging from substance abuse groups to after school programs, add an average value of $100,000. Thanks to urban sacred places, housing values in communities rise, crime rates drop, and individuals and families get the help they need. The Community Design Collaborative and Partners for Sacred Places selected three religious sites across Philadelphia, along with community partner organizations, to serve as models for incorporating civic spaces into active but underutilized sacred places. Three multidisciplinary design teams were chosen and paired with each site to re-envision the purpose-built religious properties as community hubs. Infill Philadelphia is an initiative of the Community Design Collaborative to explore key community development challenges and opportunities through design. The initiative engages communities in re-envisioning their neighborhoods, leveraging existing assets, rethinking the use of older spaces, and addressing the practical concerns of specific sites and the communities around them. Infill Philadelphia has previously addressed play space, green stormwater infrastructure, the reuse of industrial sites, food access, commercial corridor revitalization, and affordable housing.